It seems the highest IQ children would have 15 year old men mating with 40 year old women. According to a new study, published Monday in the online journal PLoS Medicine (see here), paternal age at conception generates a linear decrease in child IQ, whereas maternal age rises sharply to age 25, then rises very slightly throughout her life. See graph below cropped from the paper. 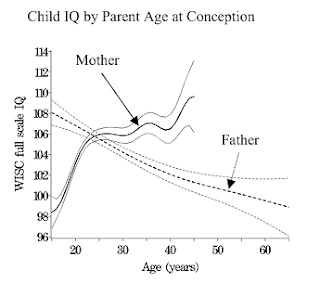 The solid line is the IQ of the child as a function of the mother's age, the dotted line as a function of the father's age. They held constant race, gestational age, socioeconomic factors, marital status, other parent's age, and mental illness, and had about 33,000 observations. Sounds pretty solid. Thus, by having my kids at 35, 37, and 41 I probably cost my kids about 4 IQ points. Then again, if I had kids in my early 20's, they wouldn't be here, some other DNA would, so they really can't complain. Plus, they enjoy the advantage of a ripened mother. I'm sure they will complain anyway. 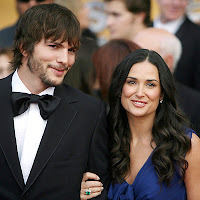 Marriages of younger men with older women are uncommon in all cultures (that I know of). Two possibilities: (a) evolution failed to adjust social customs to the production of highest IQ babies or (2) IQ is unimportant for survival. I am still leaning towards hidden factors being behind this. I almost certain there is an uncontrolled hidden factor behind this. Like parental involvement with child as a youth for the father curve. The mother curve is likely just picking up the bits of socioeconomic status not perfectly measured by their variables. 1) Stupid men can't get laid until, later in life, they have money. 2) Smart women wait to have babies.